The Cricketers now has different owners. It was probably the time of day I visited (early afternoon). But, the atmosphere felt a bit lifeless. The choice of real ale here is now restricted to Sharp's Doom Bar & Harvey's Sussex Best Bitter. A CAMRA discount is offered. But apparently this will be stopped at the end of the month, as local CAMRA members are not supporting the pub. I can't say I'm surprised, given the poor choice. FA Cup football was being shown on a couple of TVs and I had a large choice of seating. Another disappointment. Ray's regular house beer is Redemption Brewery's award-winning Trinity which although being only 3% ABV is a gorgeous drink, and rare to find south of the river. Other regular beers featured inlcude Harveys and there are guest beers usually. 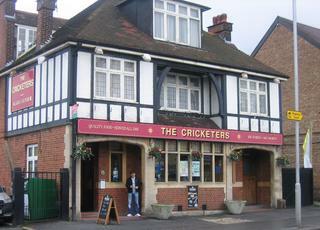 The Cricketers has been redecorated recently but retains its comfortable lived-in feeling. Tuesday nights feature decent jazz and the talented vocalist is worth the trip to Shirley Road. Simple hearty pub grub available. Great pub in which to watch Palace matches! Ray must be CPFC's greatest fan. 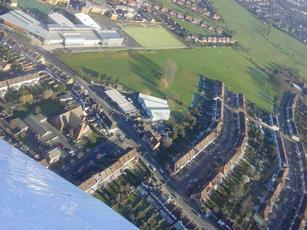 Fine around pub. Good to see that old slerpy has stopped his 50+ post campaign. He, thankfully, remains busy down Dulwich way where his zimmer-frame was impounded again. Solid and decent local pub serving decent beer. Regulars crowd around the bar but no hostility in here, friendly enough. Bonus points for seafood stall outside at the weekend. Trepidation and twitter. Yes, slerpy has lost the plot.